The award-winning AYANA Resort and Spa Bali is a world-class destination resort located on 90 hectares of cliff-top land perched above Jimbaran Bay, just 10 kilometers from Bali airport. AYANA’s majestic sunsets and ocean-front views are complemented by white-sand beach and shared facilities as Bali’s only integrated resort with RIMBA Jimbaran Bali. With full access to all dining and recreation at both AYANA and RIMBA and complimentary resort shuttle, guests enjoy the most extensive on-site facilities of any resort in Bali. There are 15 restaurants and bars including the famous Rock Bar; exclusive private beach; 11 swimming pools; world-class Spa with Aquatonic Seawater Therapy Pool and Spa on the Rocks treatment; golf-putting and fitness center; and complimentary WiFi in public areas. Located at RIMBA, the sister property, and surrounded by a stunning lake, rice paddy and edible gardens; Kampoeng Bali is a stand alone restaurant with outdoor amphitheater that welcomes you into an authentic Balinese village experience. 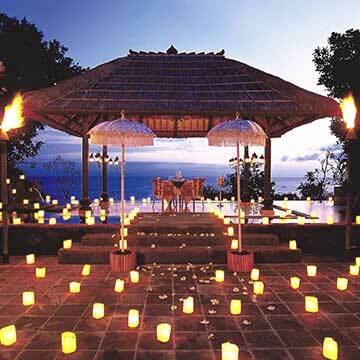 Enjoy an extensive Balinese buffet with live cooking stations as well as an exciting Kecak performance beneath the stars. Open Monday, Wednesday and Friday, this dynamic theatrical culinary program is designed to delight guests of all ages. The most spacious and acclaimed Bali luxury resort with awards from Conde Nast Traveler, Travel + Leisure and CNN among many others, AYANA offers a 290-room hotel and 78 private pool villas in Bali spread out along its 1.3 kilometer coastline, in addition to 282 rooms and suites at RIMBA. King or Two Doubles (by bed type request, no guarantee). 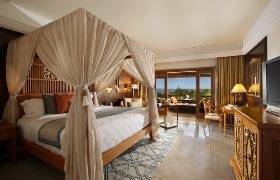 The traditionally appointed 48sqm Resort View Room showcases AYANA’s classic beauty with a balcony overlooking landscaped gardens. A comfortable and elegant décor presents quality timber furnishings and indigenous Balinese touches such as batik bed runners and custom-painted artworks created especially for AYANA by island artisans. A marble bathroom invites you to enjoy rejuvenating moments in the rain shower or bathtub..
King or Two Doubles (by bed type request, no guarantee). This room enjoys views of the Indian Ocean, across lush botanical gardens featuring tropical flora and fauna. 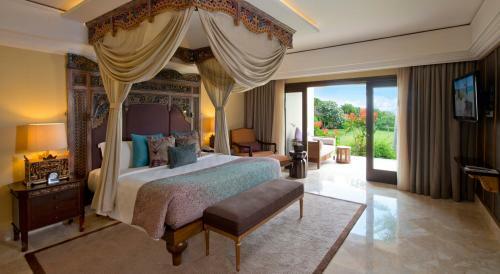 Each 48sqm (517sqf) room at AYANA Resort and Spa Bali features light, natural décor and private furnished balcony. Elegant, modern furniture is given a traditional touch in details such as batik bed runners and beautiful artworks crafted in villages around the island, whilst an intricately carved partition creates a feeling of extra space in the cozy living area with round daybed that fronts the balcony. The marbled bathroom contains separate rain shower and deep soaking bathtub. Bedding is either King-sized or twin double beds with interconnecting rooms and suites for a family vacation in Bali. Amenities include 42-inch flat-screen television, writing table, aromatic burner set and mini-bar. Complimentary tea and coffee are provided, along with fresh tropical fruits upon check-in. King or Two Doubles (by bed type request, no guarantee). 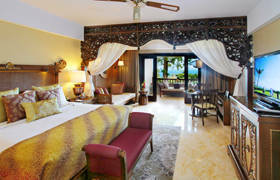 Each 48sqm (517sqf) room at AYANA Resort and Spa Bali features light, natural décor and private furnished balcony. Elegant, modern furniture is given a traditional touch in details such as batik bed runners and beautiful artworks crafted in villages around the island, whilst an intricately carved partition creates a feeling of extra space in the cozy living area with round daybed that fronts the balcony. The marbled bathroom contains separate rain shower and deep soaking bathtub. Bedding is either King-sized or twin double beds with interconnecting rooms and suites for a family vacation in Bali. Amenities include 42-inch flat-screen television, writing table, aromatic burner set and mini-bar. Complimentary tea and coffee are provided, along with fresh tropical fruits upon check-in. King or Two Doubles (by bed type request, no guarantee). 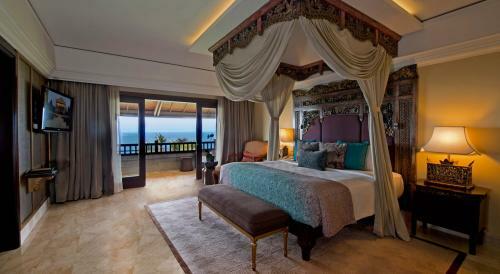 Each 48sqm (517sqf) Club Room enjoys elevated ocean views in Bali and redefines the best resort in Bali experience. The ambiance is light and airy with natural beige décor highlighted by splashes of soft tangerine and torquoise. The finest linens grace the plush four-poster canopy bed and the elegant design is complemented by traditional elements such as Batik bed runners and fine paintings. A round daybed is set in front of a furnished private balcony for a comfortable nesting. Marble bathrooms feature a rain-shower and bathtub big enough for two, along with Aromatherapy Associates products. Amenities include 42-inch flat-screen television, writing table, aromatic burner set and mini-bar. Club Lounge privileges (above) are exclusive for all Club guests. King or Two Doubles (by bed type request, no guarantee). The elegantly appointed 98sqm Terrace Suite features a comfortable living area, inviting master bedroom, two full bathrooms and Indian Ocean across lush botanical gardens view from the balcony. Classic Balinese touches include a four-poster bed draped in artisan textiles and hand-painted artworks created especially for AYANA by local artists. The marble bathroom beckons with a separate shower, deep soaking bathtub, his & hers sinks, and dressing room. King or Two Doubles (by bed type request, no guarantee). This graceful 98sqm Ocean View Suite charms with elevated Indian Ocean views from the living area, master bedroom and double private balcony. An expansive bedroom features a walk-in wardrobe, flat-screen television and four-poster canopy king-sized bed. The living room is appointed with an oversized L-shaped lounge. Two elegant marble bathrooms are presented for your convenience.